I am going to assume that you know this already, but this is such an important fact to emphasize — MB2s are everywhere. Through my time teaching, I still can’t believe that many dentists don’t know the true percentages of the presence of MB2s. They can see the look of disappointment on my face. I hope that if they learn nothing else that day, that they learn at least this ONE thing: The missed MB2 is the number one reason why I see root canals fail. And I would say that the MB root of the maxillary molar is the number one root that I see failing. Let me back up — I don’t think that it’s fair to say that “the root canal failed”. I think we need to say that “the operator failed”. I mean, if the canals were found, cleaned and shaped properly, then it wouldn’t fail, right? It shouldn’t. And that my friends, is why we have a silly movie like “Root Cause” that has started to make its way through the streaming universe, giving endodontics a bad name. It all comes down to good endo versus bad endo. If you miss this canal, you are just going to add fuel to their mission to discredit the values of keeping natural teeth, because that root canal is going to fail, and their team gets another point. So, leave your ego at the door and remember what is best for your patient, and now, what is best for your profession. These canals are hard to find and they are still hard for ME to find sometimes even after doing this for 10 years. My advice when it comes to treating the maxillary molar is not perform treatment on them until you have mastered all the other teeth. This is the LAST tooth that you should try. And if you can, do it with a microscope. It will change your life, and your success rate. Remember that the MB2s exist not only in the first molar, but they also exist in the second molar. Can you tell me the published percentages? Do you remember? The research shows that the MB2 is present in the maxillary first molar 96.1% of the time, so to me that means 100% of the time. In the second maxillary molar the MB2 is present a little less than that, but the percentage is still pretty high. It can be anywhere from 70-93%. That’s still pretty high don’t ya think? 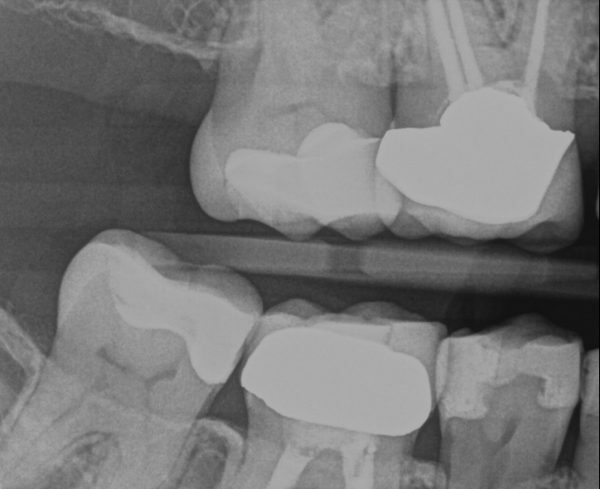 Here is a case where I found a typical MB2 in the second molar. Tooth #2 was initially symptomatic, but was necrotic upon access and had no tenderness to percussion. 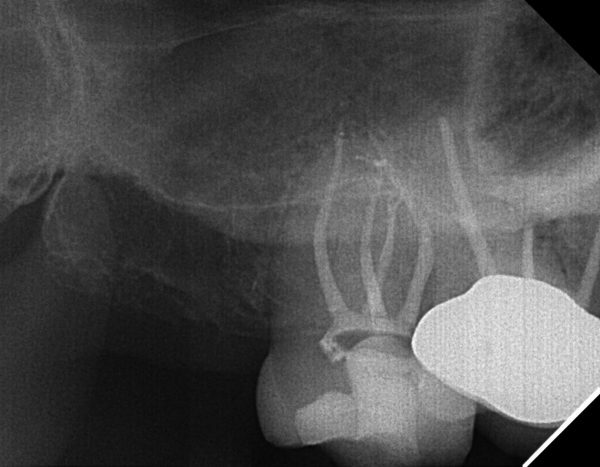 Her diagnosis was Necrotic Pulp and Asymptomatic Apical Periodontitis. Some might argue that her pain was from tooth #3 since there is a PARL around the MB root. Well, she does have a missed MB2 in that root, but she is having no pain at all coming from it. That’s next on the treatment plan. MB2s are everywhere! If you aren’t finding them then refer your patient out! Don’t forget your endodontist is always there to help you when you need it. Maxillary first molars have an MB2 pretty much all the time. Maxillary second molars have an MB2 most of the time, around 85%. Whoa that’s still pretty high! Know your percentages of canals for all teeth. 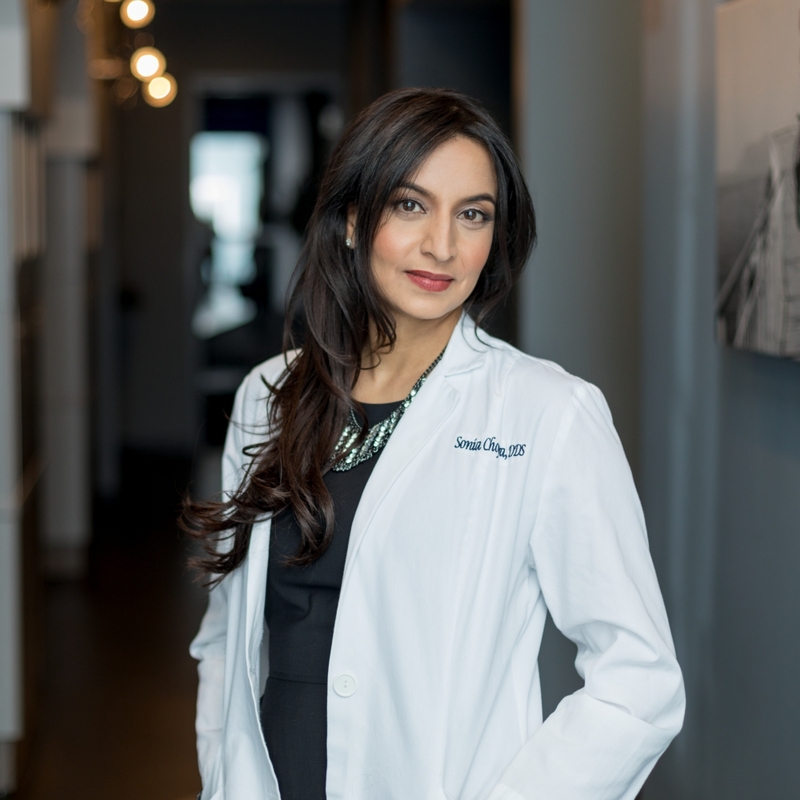 If you like these blogs and tips to grow your practice through endo, be sure to follow me on Instagram and Facebook! I did not know the percentages of MB2s was that high! 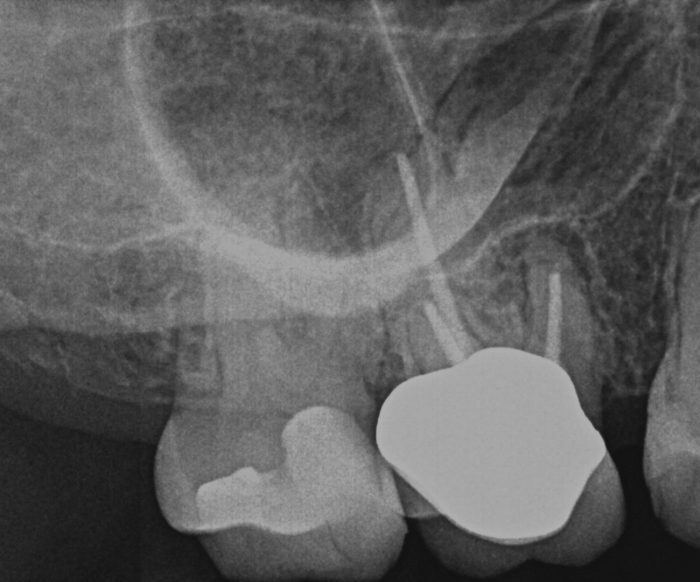 I have always been suspicious of a missed MB2 when a patient shows up with pain or PARL on an upper molar, but figured the endodontist would have found it when he/she did the initial treatment. Thanks for all these cases. I really enjoy reading them. Finding the MB2, is still a challenge for me everyday. If it weren’t for my microscope and now my CBCT, I probably would miss a ton. I truly believe that we should be finding them on almost every case. Love to learn from you. Thank you Sunita – that makes my day! Molar and they are due to my inability to find MB 2 and some time not able to negotiate it . MB2 are a lot of work. Sometimes it can take me 45 minutes just to do this one canal!! I’m glad you mentioned Your opinion regarding Root Cause. Thanks for your blogs Dr. Chopra. Lots of information. I look forward to reading them every week. So glad you’re following along! thank you for sharing such a great information, I never knew that the mb2 is so common. will keep that in my mind. great work sonia! Happy to spread that information! Thanks for the reminder. A scope seems like it would be such an asset in finding these. Also on a side note, I like the new blog format – it is easier to find an older article when I need to go back and re-read something. Thanks again for your posts. Yes, so many articles now that I needed to restructure!